Around the wider world of golf: Danielle Kang made her first LPGA victory a major at the KPMG Women’s PGA Championship; Kenny Perry grabbed his fourth Champions Tour major at the US Senior Open; Lanto Griffin won the Nashville Golf Open on the Web.com Tour (they get a cool full-size guitar as a trophy); Junggon Hwang won the Korean PGA Championship on the KPGA (that's the men's tour, not the women's); Yu Liu took the Tullymore Classic for her first Symetra Tour win; and Tommy Fleetwood won the HNA Open de France for his second ET win of the season. A look at the final round scores at the Quicken Loans National might fool you into thinking the event was an easy one, but you'd be wrong. The final third round score was the winning score! Saturday's leaders struggled on Sunday; charges from those back in the pack made it a race. For example, Rickie Fowler started out at even, then posted a 65 (with 9 birdies, a personal record) to finish at -5. He slowly worked his way up the leaderboard AFTER he finished his day, ending up T3, just two off the eventual playoff. 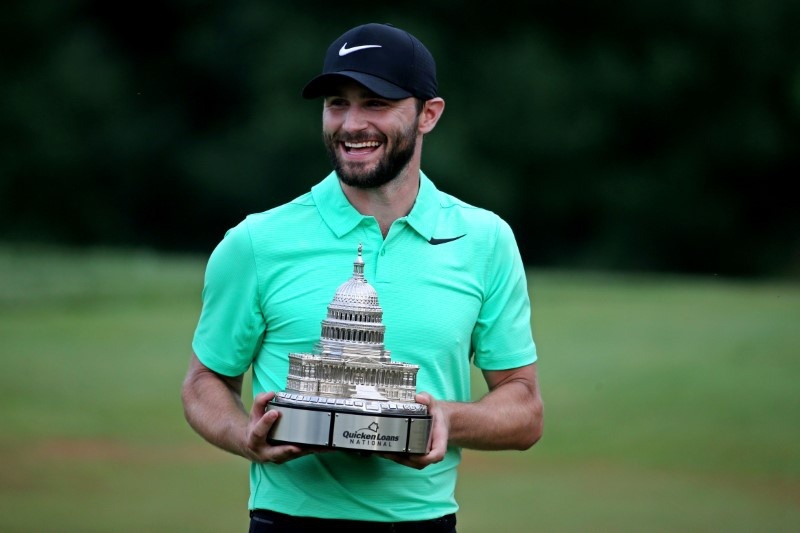 In the end, it was playing partners Kyle Stanley (winless for five years) and Charles Howell III (winless for ten years), both four off the lead to start the round, who shot joint 66s and found themselves in a playoff. While Howell lost the playoff, it's hard to be too hard on him. It was his first start after nine weeks off with a rib injury. As much as he wanted to win, it was clear that he was pleased with his finish after such a long break. And Stanley? One word says it all: tears. He wept on the 18th green and during the interviews. As we all know, confidence can be a fickle thing. Perhaps this win will be the key to getting his career back in gear. In the meantime, he can read this Limerick Summary over and over until his confidence is well-rooted again. Or could get up and down. And an extra hole gave him the means. The photo came from this page at the kdal610.com site.